Thank you for your interest in Avalon Pomeranians. We are small breeders striving for excellence in quality, type and temperament. 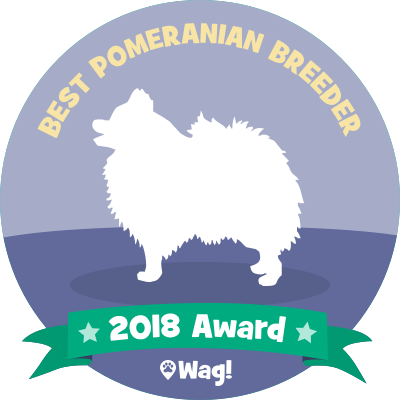 We are working to preserve the best bloodlines, and all of our puppies come from top winning show lines (pedigrees & photos available on Our Poms page). We are lifetime members of the APC (American Pomeranian Club) – a national club dedicated to improving the Pomeranian breed, and we are also AKC Breeders of Merit. Our goal is to achieve Pomeranians of excellent quality, type and temperament. Pomeranians make loving, enduring companions. They are long-lived, beautiful, intelligent, and love to please. Please visit the various links on our site to see photos, pedigrees, and information about our Poms. (To return to our home page, click “home” on the bar above or scroll to the bar below). We raise our puppies with love and attention. They are played with often, and are well socialized. This is very important in determining what kind of temperament the puppy will have as an adult. They are accustomed to both adults and children as they are played with daily by both. For ease in house training, our puppies are accustomed to using a doggie door from a young age for potty and outdoor play. All of our Poms are fed only the highest quality food to ensure good health. Annette is a Certified Clinical Nutritionist, Herbalist & Aromatherapist. She uses this knowledge to help her raise sound and healthy puppies. She has served the American Pomeranian Club as Membership Chairman, board member, and for the last 15 years as a column writer for the Pomeranian Review. Coat colors available are: Orange/Red, Cream, White, Sable, Black & Tan. The price for an Avalon puppy starts at $2,000.00. Health and satisfaction is guaranteed. A lot of hard work and attention ensures a good beginning for the pups under our care. We consider our prices to be very reasonable for puppies of this quality. We supply AKC papers, a pedigree, and an information pack with each puppy. Your puppy will have had its first vaccinations and other preventive care. Ongoing support for puppies purchased from us is always available. If we do not have puppies available now, you may place a deposit or add your name to our waiting list. Please specify male or female and your color preference. (See our Pom Care page, “Male or Female for Pet” article for reasons why you might choose a male or female as your pet). If you are interested in showing or breeding your Pom puppy, please let us know. We offer exceptional show and breeding prospect puppies from proven sires and dams. We will send notice to our mailing list as puppies become available. If you want to know more about us, learn how we began in Poms, and see photos of our “doggie condo,” click here to read our Kennel Visit written for the Pom Review.